HulaKai Hotel was originally founded by 2 friends who believed they could build a perfect spot for the graduated backpacker. In 2011 after years of living in Playa Maderas they decided to build a down to earth boutique hotel, a place we always wished he would find as a lifetime backpacker. It’s here where the original maderas family dinners, Taco Tuesday’s and and legendary sunsets became an iconic part of the Maderas lifestyle. 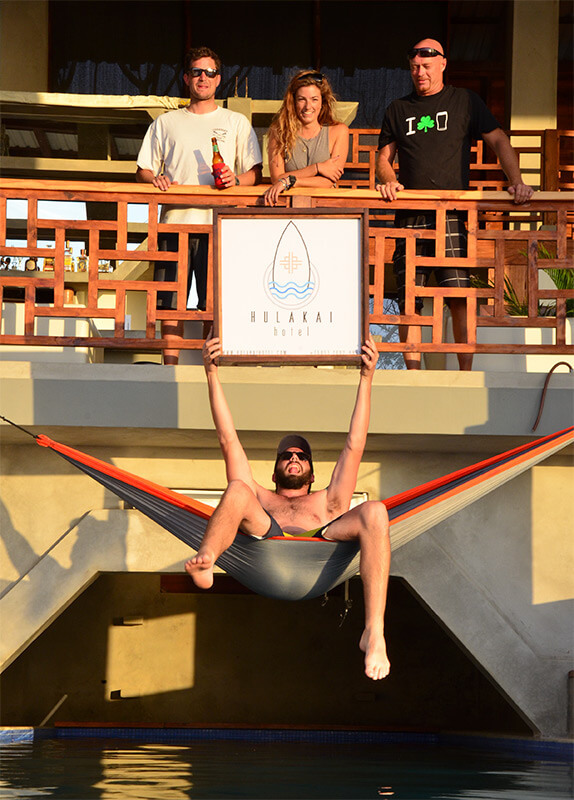 Here surfers’s, yogis, travelers, artists and graduated backpackers gather and carry on the tradition of being part of a sustainable community based project that carried the vibe, values and down to earth atmosphere of a traveler hostel. After finding an old long board from the HulaKai surf shop hanging in the hostel; the HulaKai Hotel name was born, choosing to celebrate the Pacific waters and cultures that have connected us all. We share a love of Playa Maderas and the country of Nicaragua. We host our guests with open arms and have a joy for sharing. The HulaKai Hotel is located on the upper 3 acres overlooking the surf break at Playa Maderas. The hotel is managed by the property management company William Hernandez of San Juan del Sur, Rivas. The hotel has resident hosts that are often in around the hotel and encourage you to say hello.